I can't even beleive that I'm typing that you are 8 months old. Where in the world did that time go? I don't know, but's it's going much too quickly. Here is a little snapshot of what you are both up to at your 8 month birthday. Talking all the time. You can say Mama and Dada. You've learned to clap and will even do it on cue when you're not being a turkey. You're very close to waving. I think you're getting ready to be on the move. There is for sure some scootin' going on. You have the funniest belly laugh. You're daddy can really get you going and it's hillarious. You still love your bottle and jar food. Not super crazy about the sippy cup but mommy and daddy haven't been very diligent about it, so you can blame us. You love to be played with and will sometimes get a little fussy when your companion leaves the room. You are also a talker and a grinner. You are also saying Mama and Dada. You're doing this funny little thing when you get tickled you have taken to cocking your little head to the side. It makes your audience smile, and we know how you love to perform! You are also interested in being on your belly a lot learning how to move. I think you will be crawling in no time. You're a pretty good eater, but I think you like the real food better than your bottle. You are also a good drinker with the sippy cup. You really had no problems adjusting to it. You have developed into a great sleeper. In fact, you've become the one we have to wake up in the mornings to get ready for daycare. The pics of Hulse and Livi brighten up my day! They are growing so fast. You are truly blessed with two beautiful children. Hi, I just came across your blog and I wanted to share my site with you since you have such a cute little girl! 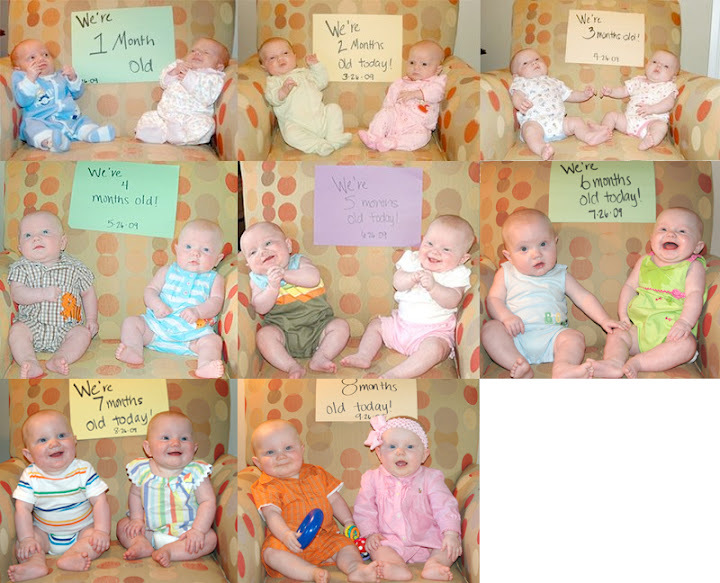 :) And I love the pics you did of them each month, such a good idea!